XYplorer 6.80.0000, released last january 4, 2008, is a multi-tabbed file manager for Windows, featuring a very powerful file search, versatile preview facilities, a highly customizable interface, and a large array of unique ways to efficiently automate frequently recurring tasks. It's extremely fast and light, it's innovative, and it's fun! array of applications to open the currently selected file(s) with. setup, so it is portable as well, and utterly easy to manage. (PFA) learned to deal with scripts. drive. If your are working in a network you'll love this one. крякнутый exe из папки Crack в установленную XYplorer's, заменить. Запустить XYplorer и использовать любые рег. 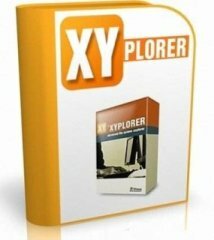 данные, перезапустить XYplorer. - Support for editing Unicode filenames. - Warp speed through new "treeless browsing". - New popular button "Copy Path/Name". - New submenu "Shortcut Target". File Search now combines Boolean Logic with Regular Expressions. History per Tab. Optionally each tab maintaines its own history. Scripting. Now there are global variables. File Search by Contents now supports pattern matching. Reporting. Now you have fully customizable one-click reports. Folder Thumbnails. Now, in Thumbnails view, folder icons optionally display a thumbnail of any file in the folder named "folder.jpg/png/gif", or of the first found *.jpg image. X close buttons on tabs. Now the tabs optionally show X close buttons. Scripting. Now the important control structures while loop and if/then/elseif/else block are supported. Scripting. The new "rotate" command brings lossless rotation of JPEG images to your home. Scripting. The new "tag" and "comment" commands join the powers of scripting and Tags & Comments. Performance. Lots of network related performance improvements.